By hearing this god Indra welcome that Goddess Laxmi and at that time all the gods are appears and with different ways they make stuti of goddess and take away the goddess Laxmi in Swarag. In any town Wealth or sons fullfill a man lives. Laxmi gives him every thing. Now the thinking of man turned into Greediness. Laxmi escapes his prayes and in the morning the man told all story to his all family members. All the members says to be ask for all different ways, anyone says that ask jewell, ask building others says. But man’s elder’s sons wife is very clever, She says- Father, if Laxmi want to gone from our house. so why other things of his like jewell and land still why. So you asked the var of love in each other. you go now in well, dharmsalas, cowsala, Schools etc gives your money and make punya. The thought of the elder’s sons wife looks good. So he spent his half money in holy works. In this way the man became a religious person and became fullfill of wealth and In the End goes to Heaven. In world the other person who placed his money in holy works. They also became fullfill with peace. Maha Laxmi’s vrat begins from bhadrapad shukal astami. In this day if we bath & make a Granthi of sixteen strings or prays godess with chandan kapoor and chameli. Than “Shri Maha Laxmi Namah” this says if you prays Maha Laxmi “oh Godess Bhagwati Laxmi! you gave me wealth, food, land, Dharam, Kanti, Kirti, Son etc. all things”. In this way you put the strings of sixteen knob around your left hand. In your left hand sixteen grass points and rice put into water throws to your body and became Ackgrachit bhadrapad krishna astami to ashvin shukal astami hears laxmi’s katha. On the day of Ashwin krishan Astami (Sixteen day) with your love praying Maha Laxmi bath in the evening dressing white clothes thanstand on the puja place turning your fece at east sitting into a clean place than astadal white Molio looks good on lotus flower, looks like Sarad or moon stand two lotus in her hands and both of sides blowing water by elephants which is Godess Maha Laxmi with Dhoop, Kapoor and Chandan prays godess Laxmi. 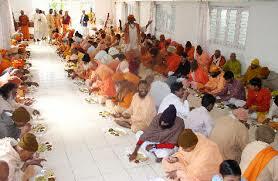 In this way all the person who take vrata for Maha Laxmi eating food to Brahaman’s and gave them clothes and other things according your capacity. Once there was Maha Raja Yudhistar asks shree krishan “Oh God! now think and told me a Vrata by which all places we loss get all them once again and make a man with wealth, son, age etc all the things. God Krishan says,”Oh Yudhistar! in satyuga when giants victory the Swarag thana Naradji says “Oh Indra! last time there was a village. the king of that village called Mangal. He had a wife named “childevi” and other was “Chol Devi” and she was the Queen. One day king Mangal and Queen Chol Devi see a place. Raja looking of that land he says Chol Devi ,”Oh chanchalaxi, from his beauty nandanvan fears i make a lawn at that place. By hearing this Chol Devi says as you wish do. For Chol Devi king makes a lawn at that place. When that lawn was full of Latas growing up and fullfill with all kinds than a pig come in that had a long height, like a moon & Sun arresting. That pig distroyed the lawn which was fullfill with all kinds. Shri Krishna says oh Yudhistar! he has been distroyed many trees, many trees rootup with their teeth and power. All the guards of the lawn may fear and told it to king. By hearing this the eyes of king became red and he says to his soldiers to kill the pig very soon. Now king also went to lawn with elephants. Soldiers arounded all the garden. When the pig come forward to king than he shoot a arrow. Pig changed into a good human body by sitting in his plane he says to the king” Oh Mahipal! aapka Kalyan Ho. You make us free. Now you hear why I became a pig. My name is Chitrath once time I was singing a song in gods and Brahama. By singing song I forget my sing for this action Brahma gave me Shrap that you born at earth by taking bearth of a pig and when all enemy victror “Mangal” kill you than you became free from this birth. So oh Mahipati! for your power that would be done. So you receive my Vardan which is rare for the gods. Maha Laxmi’s Vrat is too good. And that will gave you everything. Naradji says,oh Indra! in this way Chitrrath saying this became disappear. After that Mangal looks a Brahman which takes a Mrigchala in his one side. King says by smiling who are you from god, giant, Gandharav, or a king. You say true for what & why you come here. By hearing the words of the king he says that I was born into your country. and i am with you so you gave me order which is possible. King says, it is your new name. So you search for a pound and brought water for me. By saying this I will do it gone away by riding a horse. He goes to that place their was a pound in the way he was fallen into muddy water he break down and see all the sides. He has seen a lot of ladies on the bank of the pound. He says all the things to the ladies and rising up his hand he says- Oh what are you doing with prays, what is the method of doing this. What is the result of it. So tell me all this things. By hearing his world the group of ladies says that – Oh vipra! it is the vrat of Maha Laxmi which has been given all the things and which is calles Maya, Nature, Shakti etc. and all the ladies told him all the method of the vrat. Than They says that oh Vipra , we told you Vrat that is high in all the Vrats. By doing this you got good result. Oh vipra! by doing this Vrat you told your king about this vrat. For which not believe in the god dont told this vrat to them. after that he namaskar all the ladies and drop out his horse from muddy water and than drinking the water. He takes some water for king in Lotus leaves. he told every thing to king and by collecting all the things he done that Vrat. By the power of that Vrat he became the king of the king. Once their was where Chol Devi stands the king gone. Chol Devi seen the strings in the hand of the king she became angry and by thinking about that he became angry about king. that king was gone to other lady by the name of the hunting. He put the strings into kings hand for her Sobhagaya. So she break the strings of kings hand. with Samant, Mantri raja not understand the feelings of the Chol Devi. At that time Choldevi the other queen’s any servant come and she see the break strings and ask about it from Batuk told all this things to queen ‘Childevi’ and told to do it Vrata. After that Childevi called the Batuk do this work. After passing one year the day of Laxmi Puja the king hears the sound of Bajas, Dancing & singing. By hearing that sound the king said to ‘Nutan’ named Batuk-oh! 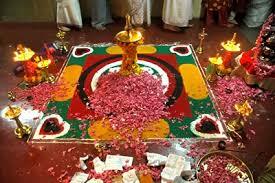 today is laxmi pujan.Where was that my Vrata String? in this way the Batuk told the all story of strings to the king.By hearing that king became angry on Choldevi and said that i have prays in Childevi’ home. Than the king accept the hand of Nutan and goes to the home of childevi. Godess Laxmi became a old lady and goes to the home of Choldevi for his exam. By seeing her she said-Oh Duste! you went away from here what is done by comein you.Laxmi devi hears her words became angry on Chol Devi and said-You have dishonoured me you became ShukarMuki for this. For that time this Mangalpur Became Kholapur. After the prays of Childevi the Mahalaxmi goes to her home in same body. Childevi prays Laxmi devi in different ways. Than Laxmiji became in his real look and queen prays Laxmi than MahaLaxmi says-Oh Childevi! I became happy with your prayer.ask for anything.Than Childevi asks – Oh godess! who does this Vrat you placed in home when the Sun and Moon stands in the sky and this day story is became famous and for you we have very true love and anyone who read this story or hear gives them very good results.MahaLaxmi saying ‘Thathasatu’ disappear at that time than Mangal king come make the Pujan of Mahalaxmi. Than the Chol Devi became jeless she goes to the place of puja But the soldiers stop her. She Became so angry and goes to forest where “Angra” Rishi lives. He saws that she is Shukardevi he told Chol Devi to doing Maha Laxmi Varta. By doing that Chol Devi became Maha Tapaswini.Once a time Mangal asks from Rishi who is that lady? than Muni told all the things to the king. Hearing this king bring Choldevi to his state. Than goes to there Chol Devi and Childevi became love to each other. With the queen king ruled at his state for a long time. He Nutan ‘Batuk’ became the minister of the king. By doing this KathaVrat became powerful and happy. Who that have done this Vrat found very good results.